Traditional Japanese kitchen knives are gaining as high recognition and attention as Japanese food itself. This book covers everything on knives, from Japanese and Chinese to western, from their styles, features, basic knowledge of knives to sharpening stones and techniques all in a single volume. 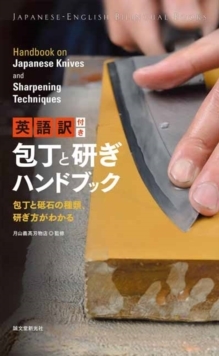 Written in both English and Japanese, this book will appeal to those with a desire to learn about Japanese knives and unique sharpening techniques, or who wish to learn more about the rich culture and tradition to people outside of Japan.